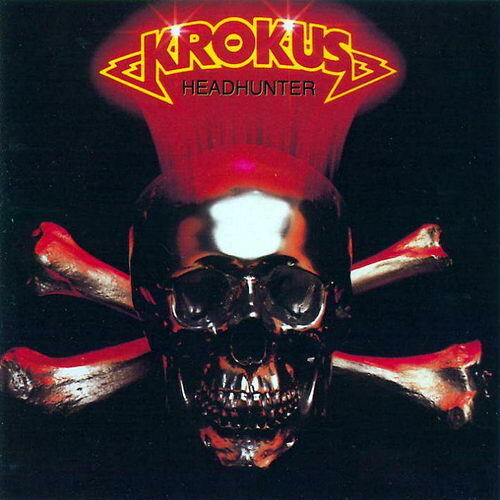 Swiss rockers Krokus recently released a new album of scorching heavy metal, Headhunter, and they play Vancouver sometime this summer. 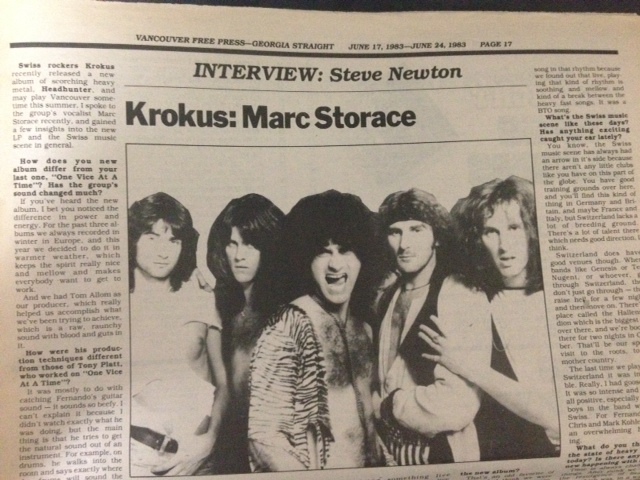 I spoke to the group’s vocalist Marc Storace recently, and gained a few insights into the new LP and the Swiss music scene in general. How does your new album differ from your last one, One Vice at a Time? Has the group’s sound changed much? If you’ve heard the new album I bet you noticed the difference in power and energy. For the past three albums we always recorded in winter in Europe, and this year we decided to do it in warmer weather, which keeps the spirit really nice and mellow and makes everybody want to get to work. And we had Tom Allom as our producer which really helped us accomplish what we’ve been trying to achieve, which is a raw, raunchy sound with blood and guts in it. How were his production techniques different from those of Tony Platt, who worked on One Vice at a Time? It was mostly to do with catching Fernando’s guitar sound–it sounds so beefy. I can’t explain it because I didn’t watch exactly what he was doing, but the main thing is that he tries to get the natural sound out of an instrument. For example, on drums he walks into the room and says exactly where the drums will sound the best for the kind of song that we’re doing. So the drums kept moving around every now and then. And re-doing the ceiling, fixing up boards to catch the reflection of cymbals. And with the vocals, for example, I found him really communicative. There was a very high level of energy going through, and it was so nice to do. Why the replacement of Freddy Steady with your new drummer Steve Pace? Well it had been coming to that with Freddy for the past year, regarding musical direction and technical ability. Steve Pace is a munch drummer, and he’s so happy to be in the band and off the vicious Southern rock circuit. He’s from Atlanta, Georgia. As an example, in the studio this time, we actually composed a whole song, called “Night Wolf”, with Steve in the studio because he’s an incredible drummer to jam with–he can jam and jam. And we couldn’t do that with Freddy somehow. I’m not trying to knock him–we’re still buddies. But the change had to come. Steve is a really good friend of Tommy Aldridge, and Tommy really respects Steve. Every time that Black Oak Arkansas was in a place where Steve was playing, and he found out about it, he’d go and watch him. When you listen to the new album you can hear what kind of drummer he is. He used to play in a band called Hydra and another band called Whitford/St. Holmes. How did you come to get Rob Halford of Judas Priest to sing on “Ready to Burn”? Well Tom Allom is the common man between Judas Priest and Krokus in that he recorded their past hits, you know. And they were up there in Florida remixing something live which they’d done, a live concert from Memphis I believe. They were there for three days, and we went out together and had a ball. We’d already known each other from playing about 25 dates together last year which were sheer hell–I mean we both gave the people hell. It was really damn good rock and roll man. So we already knew Rob, and just asked him to sing on one of our tunes. Why the cover version of Randy Bachman’s “Stayed Awake All Night” on the new album? That’s an old favourite of the band. I think we were all kind of into “American Woman”, which was also Randy Bachman–the Guess Who’s version–which we souped up and put out last year on One Vice at a Time. And this year we came by his songs again. Actually, if you listen to “American Woman” and then “Stayed Awake All Night” straightaway, you’ll see that these two songs have the rhythm and laid-back, heavy feel in common. And we were looking for another song in that rhythm because we found out that live, playing that kind of rhythm is soothing and mellow and kind of a break between the heavy fast songs. It was a BTO song. What’s the Swiss music scene like these days? Has anything exciting caught your ear lately? You know, the Swiss music scene has always had an arrow in its side because there aren’t any little clubs like you have on this part of he globe. You have good training grounds over here, and you’ll find that kind of thing in Germany and Britain, and maybe France and Italy, but Switzerland lacks a lot of breeding ground. There’s a lot of talent there which needs good direction, I think. Switzerland does have good venues though. When bands like Genesis or Ted Nugent, or whoever, go through Switzerland, they don’t just go through–they raise hell for a few nights and then move on. There’s a place called the Hallenstadion which is the biggest one over there, and we’re booked there for two nights in October. That’ll be our special visit to the roots, to the mother country. The last time we played in Switzerland it was incredible. Really, I had gooseflesh. It was so intense and it was all positive, especially for the boys in the band who are Swiss. For Fernando and Chris and Mark Kohler it was an overwhelming happening. What do you think of the state of heavy metal today? Is there anything new happening with it? Time is always changing things. After punk we saw the resurgence of heavy metal which was, in a way, the aggressive side of the hippie who couldn’t say it with flowers and kind words–only by aggressively stamping his foot down. 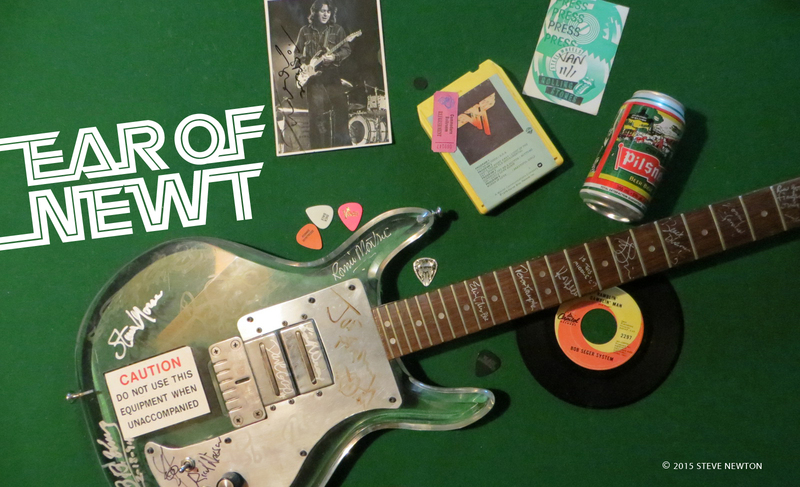 Heavy metal as we know it in its revival has now changed, and it’s becoming more melodic. The doors are open to go a step further and come out with more outstanding compositions, songs which have their own arms and legs.